They are doing their own shirts. 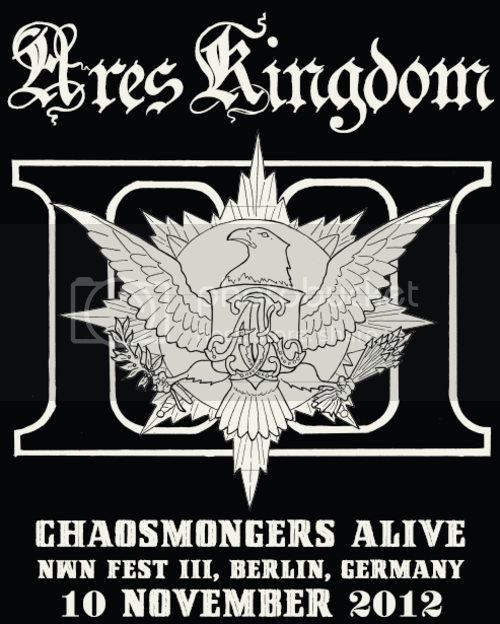 Ares Kingdom is also doing a fest exclusive shirt lim to 50. I'll post the design soon. BLASPHEMOPHAGHER new 7" and new TS will be available as well ONLY at NWN! Fest! More details in the next weeks! Ares Kingdom TS. Lim to 50 pcs from the band. Left it late to get accommodation, Pegasus seems to be fully booked any others within walking distance of the venue? What I heard was that there will only be Iron Bonehead and NWN! stalls due to place limitations. what is the train route like from Zoetermeer/Amsterdam to Berlin? is it worth traveling by that route or better to just fly quickly to Berlin? i'm probably going to that area to visit a step-brother for a couple days before going to Berlin, any rec's for stuff to see or do besides the typical red light and coffeeshops? Definitely! I hope this place will be turned into drunk madness, like the hostel two years ago. Can you sell us some orange jews? Hello! Im going from Brazil just for the fest... the tickets are really sold out already? Please if anyone have some extra tickets, please PM me! I still have one day 2/3 ticket for sale -- $76 gets it fedexed to anywhere. I also have two tickets to the Storms of Damnation show on Sunday with Vassafor. $42 gets you both, I have confirmation from the organizer that the tickets are transferable.